There’s ‘Big Joe’, the eldest of the Peaceful brothers (who doesn’t go to war because of his mental health having suffered brain damage at birth), middle brother Charlie, whom Tommo looks up to, partly as Charlie is one of those confident and assertive lads at school, and Molly, the object of both Charlie and Tommo’s affections. It is, however, the horrors of the Great War that are laid bare, almost entirely through good old-fashioned storytelling. Tommo is in military uniform throughout, and there’s a single bed that at one point gets turned on its side to act as a trench wall. A few sound effects pepper the performance, as does a little music, but aside from that, it’s all about CGI – collective group imagination. When someone known to Tommo falls pregnant outside of wedlock, the reactions of the local community are indicative of how social norms were back then. They’re all there – teachers, the sort of Armed Forces personnel who sought to build character by tearing into lower-ranking soldiers, even enemy soldiers – all portrayed by Daniel with remarkable ease and fluidity. There are moral questions asked about what was considered insubordination. Through contemporary lenses, one cannot help but at least understand, if not sympathise with (spoiler alert), Tommo’s determination to look after his wounded brother rather than leaving him for dead as his superior (in effect) commands him to do. No prior knowledge of the book is needed to be able to follow proceedings. This excellent revival serves as a good introduction to the way things were for soldiers in the First World War, as well as a poignant reminder for those of us revisiting the subject matter. It is an important era of both British and world history that thoroughly deserves such sublime productions as this one. There have been productions of this play with longer running times – when I saw it at Theatre Royal Haymarket it was long enough to justify an interval. Here, at an hour and fifteen minutes, it’s still long by Edinburgh Fringe standards, but it doesn’t feel like it. A magnificent and dynamic production. 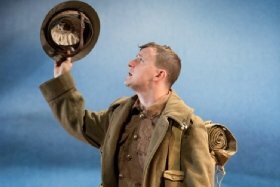 Commemorating the 100th year anniversary of the end of World War I, Michael Morpurgo’s Private Peaceful, directed by Simon Reade, returns to Edinburgh prior to a West End run and UK Tour. Andy Daniel returns to the role in Scamp Theatre’s award-winning production. Private Peaceful relives the life of Private Tommo Peaceful, a young soldier awaiting the firing squad at dawn. During the night he looks back at his short but joyful past growing up in rural Devon – his exciting first days at school, the accident in the forest that killed his father, his adventures with Molly the love of his life, and the battles and injustices of war that brought him to the front line.